Wells, Fargo & Co., 1862-64, 10¢ brown, large margins to touched at top left, bright and fresh, tied by "Wells Fargo & Co., Virginia Cty. N.T., Oct 19" oval datestamp on 3¢ pink (U35) buff entire with printed Wells Fargo frank and preprinted address to Sol. Wangenheim, San Francisco; reduced slightly at left, minor edge restoration, Very Fine appearance, ex Dale-Lichtenstein. Scott No. 143L7 Estimate $7,500 - 10,000. 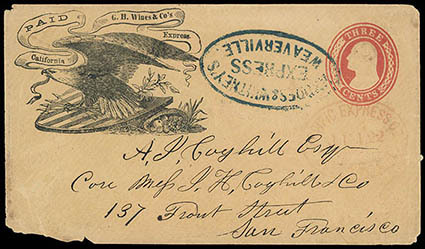 A BEAUTIFUL AND SCARCE COVER WITH THE 10¢ BROWN VIRGINIA CITY PONY EXPRESS STAMP. Solomon Wangenheim was an immigrant from Saxony, Germany, who was naturalized on April 30, 1855. He is listed as a merchant at 211 Powell in San Francisco as of July 25, 1866. Wells, Fargo & Co., 1862-64, 25¢ blue, full margins to touched, rich color, tied by blue "Wells Fargo & Co., Virginia Ct. 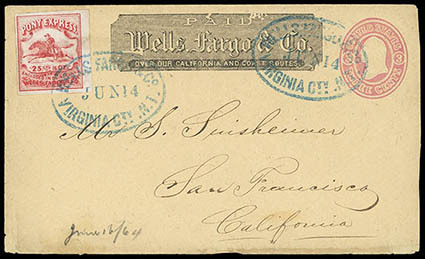 N.T., Jun 10" oval datestamp, additional strike at right cancels 3¢ pink (U35) buff entire to Sacramento Cal., pencil "$2-" rating; some repaired edge flaws at top and flap mend, Very Fine appearance, ex-F.D.Roosevelt (backstamp). Wells, Fargo & Co., 1862-64, 25¢ red, large margins all around including right sheet, bright paper, tied by blue "Wells Fargo & Co., Virginia Cty. N.T., Jun 14" oval datestamp, additional strike at right cancels 3¢ pink (U35) buff entire to San Francisco Cal., pencil "Jun 17/64" arrival docketing; some edge wear with trivial corner flaw, Very Fine, ex Dale-Lichtenstein. Scott No. 143L9 Estimate $7,500 - 10,000. 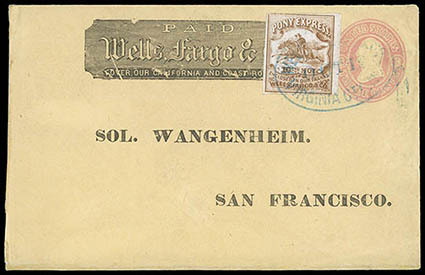 A CHOICE 25¢ RED VIRGINIA CITY PONY EXPRESS COVER WITH THE WELLS FARGO VIRGINIA CITY DATESTAMP. G.H. 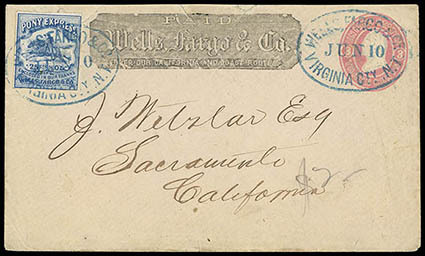 Wines & Co.'s Express, California, Paid, spectacular eagle and shield design printed frank on 3¢ red (U10) buff entire cancelled by blue bold "Rhodes & Whitney's Express, Weaverville" oval and red "Pacific Express Co., Shasta, Jul 22" oval handstamps to San Francisco Cal. ; cover with opening tear on back ending in a tear on front at bottom left corner, otherwise Very Fine, ex-Risvold. Thomas No. WIE-001 Estimate $4,000 - 6,000. A STRIKING THREE COMPANY CONJUNCTIVE USE WITH G.H. WINES & CO'S EXPRESS, RHODES & WHITNEY'S EXPRESS AND PACIFIC EXPRESS CO.
G.H. Wines was based in San Francisco and ran into Sacramento. From these locations they extended into both the northern and southern mining areas of early California., and into Oregon through the use of other feeder expresses. They had offices in Sacramento, San Francisco and New York. They connected with the east coast through Nicaragua.